Abortion law is settled law right? Besides, the number of abortions is going down, so why fight about it? Aren't there other things more important than the abortion issue? One of the most annoying things is for someone to argue with you about something which, in the grand scheme of things, makes no difference at all, so why fight about abortion? It's a personal choice anyway, right? Every 30 seconds there is an abortion, but why should that be alarming? It really all comes down to one question, what happens when an abortion takes place? The answer to this question is the answer to whether we should "argue" about abortion. Much of our society lives in denial and avoids the difficult answer to that question. We argue about border walls, immigration, poverty, legalizing drugs, welfare, and so on. All of those things are worth discussion and vigorous debate. Yet, none of them can hold a candle to the issue of abortion. The reason is simple, while all of those things have the potential of denying people various rights or dignity that is due to every person, none of them, by necessity, deny the most foundational human or civil right of all, life itself. The answer tot he question of what happens when an abortion takes place is this, an innocent human life is intentionally extinguished. I have participated in public debate about this issue of abortion, you can see that here. I am not going to reargue the issue here. However, there is another question that should be asked and answered; who are the most vulnerable and voiceless? The answer to that seems obvious, the unborn child cannot speak or do anything else without protection. While there are many whose voices are oppressed, there are no others who are more helpless and voiceless than the unborn. The unborn are exactly the kind of people that Proverbs 31:8-9 speaks about when it says we should speak up for those who cannot speak for themselves. While there are many issues of great importance that deserve our attention, the abortion/life issue is the greatest civil rights and human rights crisis of our time. More people were killed by abortion world wide in 2018 than any other thing, and it's not close. No other issue deserves more attention than this one, yet, many avoid the issue. If you desire to speak up on this issue see this web site: Life Training Institute. Don't Make a New Years Resolution! Why not? Because it isn't meaningful. Don't get me wrong, I like goals, but goals are different from New Years Resolutions. I make goals when I need to make them. There are certainly times during the year to reflect upon what things you need to change in your life, and the end of one year can be one of those times, but reflection upon needed life change should be frequent. Setting goals is an essential part of growth and should be made upon reflection upon your life as it is now. New Years resolutions, as they are traditionally done, are not thoughtful goals made based on serious reflection. I have reading goals for each year, but again, those are intentional and thoughtful. They are made upon reflection of what I have read the previous year. I also set similar goals in the summer as it relates to the church I lead. Frankly, these goals aren't a "life change" like a resolution. They are goals I make every year and sometimes do not accomplish. Nevertheless, I grow throughout the year in my attempt. Life change should be made as needed. By life change, I mean establishing new habits that will serve you beyond one year. My reading habits will serve me for the rest of my life unless I go blind and deaf. Over a year ago I made some dieting changes in my life, not to lose a certain amount of weight (although I did lose weight) but to become healthy for the rest of my life. I may have to change my eating habits in the future as my body changes and my activities change, but I made a change that will be constant for the rest of my life. I decided to eat healthy for the rest of my life. It was a life change, not a new years resolution. I will not measure my success at the end of each year, but each day. When I am not successful I start again the next day. Go ahead, set a goal, but don't do a new years resolution. make is specific and be disciplined about following through. Make it a life change that will last for the rest of your life. Was John Allen Chau a Fool or an Example? John Chau's story reminds me of Jim Elliot's sacrifice, along with 4 of his partners, to reach people who have never heard the gospel of Jesus Christ. The hours and days after their death must have been devestating. Certainly some were asking if their mission to reach Huaorani people would ever be accomplished. God was faithful and the Huaorani, including the very people who killed Jim and his friends, did receive the Gospel. If you read the Washington Post John Chau was a fool for even attempting to bring the gospel to the North Sentinelese people. Many others even Christians echo their opinion. The critiques are plenty, but it has been my observation that these critiques have come primarily from people who have spent little time on the mission field from the comfort of their plush American homes and offices. There are two different kinds of critiques. Those outside of the Christian faith or on the liberal end of the Christian faith question whether it is morally right to bring the gospel to those who have not heard it. That is a critique founded on the clash of different world-views. Those who believe that this life is all that there is or at least all that matters do think about what comes after this life. Therefore anything that might harm (in their view) the way a person or group of people choose to live would be considered morally wrong. The North Sentinelese should then be left alone. For the Christian who believes in life after death that either leads to eternal damnation or eternal life with God and the authority and truth of Scripture there is no question that bringing the gospel to people who have never heard it is the right thing to do. Scripture commands the church to take the good news of Jesus to the ends of the earth (Acts 1:8; Mt. 28:19; etc.). Further, the words of Jesus in John 14 reminds the Christian of the exclusivity of the Christian faith. As a result there should be no hesitation on the part of the Christian to bring the gospel to the ends of the earth and to take head to the words of Jim Elliot, "He is no fool who gives what he cannot keep to gain what he cannot lose." While we ought not be flippant with our lives on this side of eternity, we ought not love this life more than the next. Again the words of Jesus come to mind, "For whoever wants to save their life will lose it, but whoever loses their life for me will find it" (Mt. 16:25). The second kind of critique is focused on the methods John Chau employed in his attempts to reach the North Sentinelese people. I am not a missiologist so I will not attempt a defense of John Chau on this front. Instead I will refer you to Ed Stetzer's article which is also found in the Washington Post. While it is wise to look at a person's failed attempt and ask what we can do better in order to be more effective in reaching people with the good news of Jesus Christ, it is arrogant to do so if we are unwilling to get up out of our lazy boy and reach the people across the street, in the next cubical over, or others in our circle of life. Even if we are reaching across the street, we ought to be at least willing to reach those around the world, to go to the ends of the earth. Are we storing up treasure here on earth or in heaven? Do we really look forward to the scene in Revelation 7 playing out where every tribe and every nation is gathered around the throne worshiping? The church has lost the urgency to evangelize the world and bring all people to a saving knowledge of Jesus Christ. Is it not at the very heart of God that all people come to know Jesus (1 Tim. 2)? Let's ask questions to learn what Chau could have done better, not in an attempt to ignore this unengaged and unreached people, but so that we can be more effective in reaching them. Perhaps John Allen Chau's death will be a wake up call to the rest of us and restore an urgency to spread the good news of Jesus Christ to all. John Allen Chau was courageous, let his courage inspire the rest of us! He did it right, he being my daughter's fiancé. To be honest, it is all a little surreal to be thinking about my daughter getting married. Nevertheless, she will be marrying someone I believe is a good man. He did well not only in asking for my blessing, but in approaching the relationship as a whole. When I realized the question was eminent I began thinking about what I would say and what he would say. I may not have many opportunities moving forward to speak into the life of my future son-in-law so I wanted to be prepared. I did google searches trying to figure out if there was some kind of formula or advice and I found little that I thought was very helpful. So, while I will not share all the details (that's between Paul and I), I wanted to give a sketch of what I did in hopes that you may find it helpful if you are facing a similar situation. But first, I want to recognize that every situation is different and you may have to adjust what you do according to your situation. Before this all went down, I made sure that my daughter knew I expected to be asked. Sure, it sounds antiquated, but it is a tradition that is beneficial for all involved. I always made sure that my daughter knew I didn't want her to marry a week man. This tradition plays a role in making sure that the suitor has to have at least enough courage to look their potential father-in-law in the face and ask for his blessing. Courage and boldness is something I value greatly and I have taught both of my kids that this is important. Furthermore, this was for her good. I also made sure that I had built up enough trust with my daughter that she would push her future husband, whoever he turned out to be, to ask for my blessing. There are few circumstances where I would withhold said blessing, but I suppose they do exist. Fortunately she found a guy who has courage and whose dad brought him up to honor this tradition. He also talked to me when he wanted to date Catrina...good man! ​When the time came, I didn't bail him out. It takes courage to ask for this blessing, but it is also formational in a man's character. I'm not much for small talk, usually I just jump right into topics, but I needed to give him space to work up to the question even when I was pretty sure that is what was coming. I'll admit, I may not be the easiest person to ask such a question and I may have unintentionally made this a little harder than it had to be; nevertheless, he rose to the occasion and I am thankful for it. When he popped the blessing question, I gave a short answer and a long answer. While the temptation might be to make him squirm or suffer a little bit, I find that to be a little sadistic. I told him I had a short answer and a long answer. The short answer was "yes, you have my blessing." I must admit, if I was not going to give my blessing I would likely only give a long answer. ​The long answer was more involved. I told him what I expected. Some people might find that presumptuous, who am I to tell my daughter's future husband what I expected. He is marrying her, not me...right? I will tell you why I have the right to do such a thing, I have spent the last 20 years loving her, raising her, and preparing her for this next stage of her life. The person she has become is, for better or worse, at least in part the result of how her mother and I raised her. More could be said about this, but that is enough for now. I did tell him what I expected, but I don't expect him to be perfect and I don't expect unreasonable things. I do expect them to struggle, face trials, and have to learn to love each other in new ways. I'm not going to go through exactly what I said, you should work that out for you and your situation, but be reasonable and don't be afraid to give a reasonable challenge. I read Scripture to him. I am a pastor, but that doesn't really matter, I would have done it anyway. I read him the passage out of Ephesians 5:21ff. I offered some additional thoughts about the text. Becoming a husband is not for the faint of heart and I wanted to make sure he knew that...I think he does and I think he is up for the challenge. I could have read other passages that would certainly be relevant, but that is the one I chose. You can make your own choice. Last and perhaps most important, I prayed with and for him. The content of my prayer is for me, him, and God. The truth is, that was not the first time I had prayed for him and my daughter and it will not be the last by a long shot, but it was the first time I prayed with him as I prayed for him and my daughter. I won't forget that time of prayer, and I hope he won't either. If you have ideas of things you think would be good to add or comments on what I did, leave your thoughts in the comments. I have been praying for my daughter's future husband since long before I met him, but now that "he" has a name, "Paul," my prayers are changing. Paul loves Jesus and I believe he loves my daughter. When I tell people my daughter got engaged, they will often ask, "do you like him?" I will often somewhat jokingly say, "I keep trying to find reasons not to, but I failed in that endeavor." Paul loves Jesus and I am very thankful for that. You might say that prayer has been answered. So what do I pray for now? I pray for perseverance. The key element for a long term, successful marriage is not communication methods, conflict resolution skills, or enjoying the same activities. The key element to a long term, successful marriage is perseverance. I don't wonder whether or not the marriage between Catrina and Paul will have difficulties. I am certain it will. I am also certain some of those difficulties will be caused by the fallenness of both of those people just as my marriage to my wife for the last 25 years has had difficulties caused by me and my wife. The reason my wife and I remain married and love each other is because we have persevered. We have remained committed to each other when it would have been easier to quit. Forebearance, as the NIV translates it, is one of the fruits of the Spirit in Galatians 5:22. The Greek word that is translated, "μακροθυμία" this word literally means "state of being able to bear up under provocation, forbearance, patience" (BDAG). That's the first thing I pray for. I pray for a high capacity to forgive. As I stated earlier, both Catrina and Paul are fallen and sinful people even if they are redeemed by the grace of God. An unwillingness to forgive will cause resentment toward one's spouse. I pray they will employ what the apostle Paul says in Col. 3:13, "Bear with each other and forgive one another...Forgive as the Lord forgave you." I pray they will sanctify each other. That's a religious word, more specifically a Christian churchy word. Nevertheless, it is the right word. I understand that it is only through the work of the Holy Spirit in their life that through the blood of Jesus Christ that they will be sanctified, but if their marriage is a godly one (I believe it will be) they will spur one another on toward love and good deeds and each one will make the other better (Heb. 10:24; Eph. 5:22ff). I pray for for ministry. I don't know if they will ever go into full time, vocational ministry or not. I don't necessarily pray for that to happen although I would welcome it if the Lord wills. I don't even pray that they will volunteer at a church, although I hope they do. What I pray for is ministry that flows from their love for Jesus and their desire to see the world make peace with God so that none would perish. This reflects God's heart for the world (John 3:16; 2 Peter 3:9). I pray their home will be a place where the presence of God is evident and their lives together will reflect the love and grace God has shown them. I pray for many more things as well, but whatever happens in their lives together, whatever struggles they face, whatever hurts they experience if they are able to do these four things I will be ecstatic. William Arndt et al., A Greek-English Lexicon of the New Testament and Other Early Christian Literature (Chicago: University of Chicago Press, 2000), 612. Yes, you read the title of this post correctly. You are probably thinking it is ridiculous to think in those terms. You're wrong. I began thinking and praying about my daughter's future husband when she was very young. Several weeks ago, Paul Songer IV asked me for my blessing to ask my daughter for her hand in marriage. Yesterday he asked her to marry him...she said yes. I have been preparing her for this day for years. When she was a baby I would occasionally think about how some day some guy was going to come along and her heart was going to turn away from her daddy and toward some guy who would marry her. It's hard not to think in terms of him taring her away from me, but that is not really what is happening. I am stepping away from the role I once had and, in some sense, giving that to him. However, her mother and I have been preparing her for this her entire life. When she was little, her mother and I just did our best to teach her how to be a Godly woman. Our hope was that Godly woman would attract a Godly man. I believe that has happened. She witnessed two imperfect married people work through the pain life brings and live joyous lives focused on serving God. This was instrumental to her preparation as she witnessed us have disagreements, work through anger, and so on. It's more than just modeling a loving relationship between her parents, we taught her about marriage both by modeling and by having certain important conversations along the way. Catrina: Daddy, some of my friends have boyfriends, do you think I could have a boyfriend too? Daddy: Catrina, what do you think the point of having a boyfriend is? Daddy: The reason people date or have boyfriends is to figure out who they are going to marry. How old do you think you should be before you get married? Catrina: You told me I couldn't get married until I was 30! Daddy: Well, I was joking...I think...you could probably get married sooner than that, how about 25, does that sound okay? Daddy: Well, how long do you think you should date someone before you get engaged? Daddy: Well, a year would probably be a good minimum, but let's say 2 years. Daddy: How long do you think you should be engaged for? Daddy: A year is okay, but I think shorter engagements are better, let's say 6 months. Daddy: So if you are going to date for two years and have a 6 month engagement and get married at the age of 25 what age would that make you when you start dating that person? Daddy: That would make you around 22 years old. Catrina: So I can start dating when I'm 22? Daddy: Well, you might not find the guy you are going to marry with the first guy you start dating. You might date a few or several guys before you find one you want to marry. So, let's say this, you probably don't need to really think about dating until college, or at least high school. You might find that conversation humorous, I did. Nevertheless, we always taught our daughter that the reason you date isn't to have fun or mess around, it is to find out whether a person is worthy of being your spouse. We had numerous other conversations along the way. We talked about the most important things about a person who wants be your husband. We talked about what appropriate physical boundaries were. We talked about why it is important for a boy to show respect to our family and to have the courage to come talk to me in order to date her. We talked about finding someone who you are willing to have lead you. We talked about all kinds of things. We did the occasional daddy daughter date, even when she didn't want to. we spoke truth to her about her boyfriends and never hid what we saw in them, but always did so with love, respect, and gentleness (to the extent that I am able to be gentle). I worked hard to lead her well so that she would expect her future husband to lead her well. I wanted her to know good leadership when she saw it. I also wanted her to know what bad leadership looked like so she could reject it quickly. I am sure I was far from perfect, but I'd like to think that I contributed something in the process. The results? Well, I don't know with absolute certainty, but I'm very optimistic. She is now engaged to a man who was her second boyfriend. They will get married and then they will have to work hard to make it a healthy and loving marriage. That said, she was able to recognize the fakers, the wanna bees, and those that were not marriage material from a mile away. She found a man who had the guts to sit across from me and have some very candid conversations about dating my daughter, his intention to marry her, his history with dating, and so on. Well done Paul! It all started when she was very young. We raise our children to be Godly adults not intemperate children. This past summer I started running on a regular basis and this next week I am running the Cougar Dash at Colorado Christian University. I started running specifically to improve my cardio for Jiu Jitsu tournaments. The truth is I have always hated running, but over the last several months it has grown on my. I now run 4 to 5 days a week and occasionally I will run 6 days. The truth is I have a mental battle almost every time I go running. I like the idea of running more than actually running. I dread starting my runs and quite often during the run I want to quit and walk home. The temptation is significant. The truth is, I'm kind of lazy. If you talk to people who know me many would probably say I am a really disciplined person. That is only partly true; I am disciplined with certain things and struggle with others. I suspect that is the case for most people. For years I thought running was something I should do, but I always had excuses and some of them seemed pretty legit. My knees hurt and they hurt a lot more when I was 250 lbs. If I ran a mile I would be sore for a week. I had all kinds of excuses. My newest one is weather, it's getting too cold. The truth is I have tendencies towards laziness and I just think it's too hard. When I go on my runs I don't get some euphoric high. 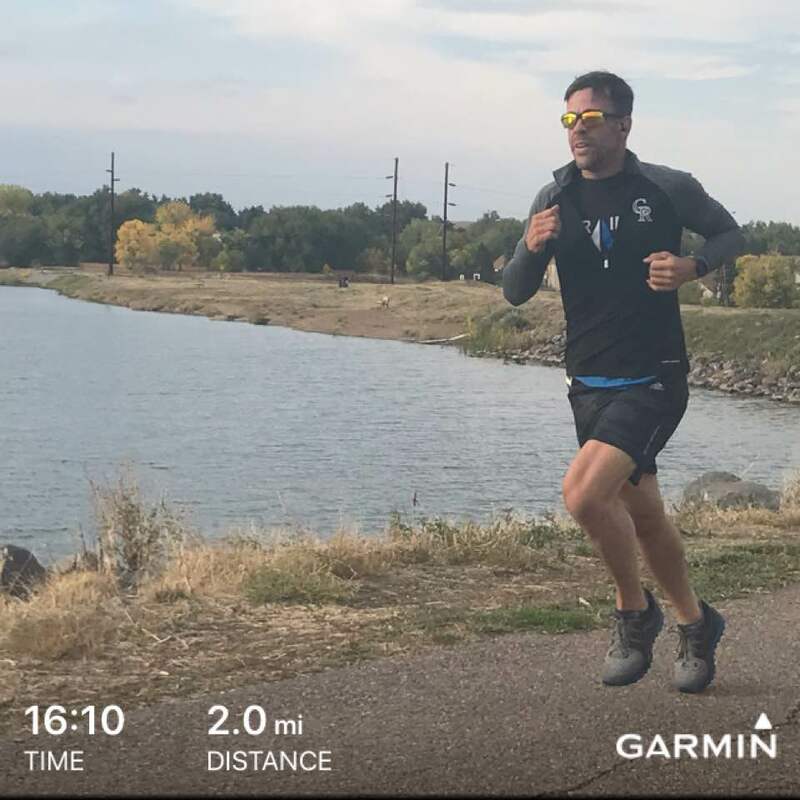 I do enjoy the time unplugging from the world while I run and listen to music, but a lot of the time I want to just give in and go home after a couple miles. On my long runs (5-7 miles) this can happen multiple times on a run. I have learned to push through the temptation to quit when my knees hurt and my legs are sore. Sometimes I have pain before I even start my runs. I don't want to make it sound any worse than it is, but it does happen. The answer is simple, go anyway. Don't quit. Success breeds success. When I push through once, the next time it is a little easier. When I make my last mile my best mile (that doesn't always happen) the next time I can run a little further. It's never how you start, but how you finish. The author of Hebrews reminds us, "Therefore, since we are surrounded by such a great cloud of witnesses, let us throw off everything that hinders and the sin that so easily entangles. And let us run with perseverance the race marked out for us, fixing our eyes on Jesus, the pioneer and perfecter of faith" (Heb. 12:1-2). Of course that is talking about our spiritual life, but the principle holds true in all aspects of life. When I run with perseverance, it impacts the other areas of my life. I develop a discipline of perseverance that serves me in my work, in my relationships, and in other endeavors. In Proverbs 10:4 it says, "Lazy hands make for poverty, but diligent hands bring wealth." My greatest fear is not that I am too busy or that I will have too much going on in my life, but that I will become lazy and idle. Running has been good for my soul and my discipline. Tomorrow I go run, it's likely going to be cold, but I will go anyway. I will not fade away into laziness, I will discipline my body, my mind, and my soul and in so doing, honor God in all that I do (1 Cor. 10:31). This weekend the United States Senate will vote on the confirmation of Judge Kavanaugh to the Supreme Court. It is a significant understatement to say that we as a country are very divided and this issue is the center piece of that division at the moment. I've weighed in on my thoughts elsewhere and will not continue to do so here. Instead, I would like to address the division we see in our country. Why are we more divided and political than ever? Can the divided States of America become the United States of America? Why are we so divided? The answer is simple and complex. The simple answer is that we are fallen people, we are totally depraved (to use more theological terms). Put another way, we are fallen in every aspect of our lives. That is not to say we can do no good; however, our ability to reason, our emotions, our moral compass, our sexuality, our work, and much more are all impacted by our fallen nature. That, quite obviously includes our politics. Division is part of our fallenness. Because we are all impacted by the fall we are all not only capable to arrive at wrong conclusions and passionately support them as truth, but we all absolutely do arrive at wrong conclusions. The search for truth is mitigated by our fallenness and sin nature. This has come out in the Kavanaugh hearings quite explicitly. Our emotions and our inability to synthesize all the known facts with all the unanswered questions has led to a variety of beliefs. That doesn' mean no one knows or that the truth can never be known, but in many cases the truth can be difficult to ascertain. Our fallenness creates division. If truth were readily available and not veiled because of our fallen nature there would be little to no division in our world not to mention our country. Reality is different though isn't it? The reality we face is that a search for truth is as much veiled by reason impacted by fallenness as it is our search for utopia or our imperfect and fallen emotions. Division has existed since Cain killed Abel and it will continue to exist until Jesus sits on the throne. Fortunately, the American system of government was designed with division in mind. There was great division even as the constitution was being ratified. It was obvious that a king, like King George, could abuse a governmental system, but it was unclear if this new republic could or would avoid such corruption and abuses. Nevertheless, there are three branches of power specifically so that one party, no matter how partisan, would have a very hard time acquiring all the power. In other words, division was anticipated by our founding fathers and the checks and balances that are in place are intended to mitigate division. We are a divided country, but this isn't as new as the media would have you believe. There have been many divisive times in our history. None rings truer that the civil war, but there are many others as well. Our founding was a divided time, the civil rights movement was a divided time, and there were others. The good news is that we have been able to come together when we needed to often having fought it out. let our prayer be that we will lay claim to the phrase, "one nation under God..." once again. It is only under God that we will be able to be united. Checks and balances may provide enough time for our nation to come together again, but unless it involves submission to God, unity will be fleeting. In the last week there has been a lot said about choosing who to believe regarding the Senate hearings and the accusations made by Dr. Ford against Brett Kavanaugh. On social media there has been a myriad of memes requesting to be shared identifying who you believe as if your proclamation of which "side" you are on will make any real difference in the end. Of course the implication is that one of them is lying. Likewise, the words "victim" and "credible" are being maligned. One side is quick to point out that only about 8% of accusations are false and that the victim should be given the benefit of the doubt. The other side is quick to point out the inconsistencies of a 36 year old memory and the lack of collaboration by witnesses. Choosing who you believe isn't really about your evaluation of the truth, but a political identification. Maybe that isn't what you intend, but that is how it is understood whether that is your intent or not. This word "belief" is being strewn about as if it is some kind of subjective label that is really void of any kind of serious consideration. This word deserves more attention than it is being given and should be attached to something other than a person or political ideology. Belief is an epistemic term and should be evaluated from that perspective. Many people are arriving at their beliefs based on a variety of issues that may not be the best way to approach this issue. Those who have experienced some kind of sexual assault seem very quick to believe Dr. Ford. This is understandable as her story connects with their own story. They will quickly say that her story seems "credible." After hearing at least some of her story live I found myself thinking that her story sounded sincere and on a surface level (that is to say without further evaluation) very believable. Likewise, when I heard Kavanaugh's defense I was surprised by how sincere and believable he came across. I will admit from the start that I identified with his story on a deeper level, in part, because I am a pastor and I have been told and believe that my ministry and my livelihood is one false accusation away from being over. I know others who have had false accusations made against them and though they have been restored to ministry after they were cleared of the charges, those accusations were harmful to them, their families, and their careers in ways that are hard to comprehend. However, my identification with Kavanaugh's defense is not enough to arrive at the belief that he is telling the truth and Dr. Ford is not telling the truth. So, how should one arrive at belief regarding this and other issues? First, let's be honest about the level of certainty that is possible regarding a 36 year old accusation. The reality is that we will likely never know with a 100% certainty (I am not talking about psychological certainty but logical certainty) what happened. What are good reasons to arrive at some kind of belief? Should we simply believe something because it is on the internet? Of course not, this is more than that isn't it? Should we believe something simply because someone said it in a believable manner? Not in the house I grew up in, we made a game out of getting our siblings, friends, and others to believe lies...we called it joking around. That is obviously not what is happening here, but lying isn't a new phenomena, not to mention the possibility of false memories or the synthesizing of several memories to form one memory that may or may not be accurate. While I am not a memory expert, I have done a enough reading in recent days to learn that memories are malleable and unreliable even when they involve traumatic events and especially when they are 36 years old. Of course this means that both Kavanaugh and Dr. Ford could be misremembering something that happened 36 years ago, especially considering that alcohol was involved (according to Dr. Ford). What should count as evidence that leads to a belief? It isn't evidence that I tend to connect or identify with Kavanaugh's story or that you might connect or identify with Dr. Ford's story. While this may influence our belief, emotional connection isn't sufficient for coming to a conclusion about who to believe. Assuming that the best that can be done in this case is corroborating testimony it would certainly be possible to come to the conclusion that this event likely happened as Dr. Ford described it (assign whatever percentage of certainty you would like to the word "likely" as long as it is over 50%). Even then, what percentage of certainty is enough to end a person's career? I'll let you arrive at your own conclusion, but for me it would have to be fairly high. Another word that is being thrown around without much thought is the word "victim." The person who is a victim is the one who has had a wrong done against them. In this case, Dr. Ford is the victim...right? The answer is, maybe. Unless the wrong being done is a false accusation based on faulty memories or outright lying. Then Judge Kavanaugh is the victim. So when people say we should believe the victim, that begs for the question, who is the victim? It is possible that they are both victims. It is possible that she experienced sexual assault and that Kavanaugh wasn't the perpetrator (I find this to be a reasonable possibility given how memories work, especially old ones). Determining who the victim is and what they are a victim of is precisely what this is all about. It should be mentioned that statistically false claims of sexual assault are only about 8% of all claims; but, then again, that is almost 1 out of every 10. That is enough to make a false claim a very reasonable possibility. I also wonder if more scrutiny regarding that statistic would reveal that it is more prevalent than that, but that is conjecture on my part. Of course it is also true that people routinely lie about how much alcohol they consume, just another part of the equation in evaluating Dr. Ford's testimony of having 1 beer. Last, people keep talking about "credible" statements made by Dr. Ford and Kavanaugh as if "credibility" is some kind of evidential standard. I have been using the word believable in this post because I think it more closely reflects what people really mean. Both people appear to be sincere and both have provided at least some level of detail although those details have been largely unverifiable. So, what appears initially as "credible" becomes less so if the details provided cannot be verified. Credibility is more than an initial reaction based on how connected one might feel to the story being told. It also involves whether a narrative is being expressed in a way that allows for verification and subsequently whether it is actually verified. Therein lies the problem with both stories. Kavanaugh can provide a calendar and say the event never happened, but just because something isn't on a calendar doesn't mean it didn't happen. Unfortunately Dr. Ford didn't provide a time, day, or location which makes it almost impossible to verify and almost impossible for Judge Kavanaugh to supply a alibi and does call into question the credibility of the story. So where does this leave us? You can come to your own conclusion, but I hope you will go beyond emotional connection to one story or the other before you do come to that conclusion. Language has been and will continue to be abused for the sake of political expediency, but we can make that manipulation less effective if we can evaluate the rhetoric properly. We ought to believe what is true, not simply what we want to be true or what we emotionally connect with. Unfortunately, there is no action going forward that will not have significant implications for Dr. Ford and Judge Kavanaugh. Someone is going to be harmed in some way as this unfolds. As a Christian, I am praying that the right decision will be made by the senate and that the truth will be made known. But, I'm not confident that we will ever know with certainty. Ford seemed to be sincere. In fact, after hearing part of her opening I thought Kavanaugh was finished. She didn't seem to be lying or attempting a great deception. Some use the word credible, but I don't think that means what people think it means. She had some details, but was missing a lot of others. I believe she experienced some kind of sexual assault that has traumatized her. I certainly didn't think was some kind of political operative after her testimony. Again, this is gut reaction, I don't have proof. Kavanaugh was, in my mind, more convincing. He was angry, and he should have been. If he was dispassionate I would probably be less likely to believe him. I thought he was equally sincere in his denial. He also provided many character witnesses. Again that doesn't prove anything, but it certainly provides a voice. I especially loved his testimony regarding his daughter praying for "the lady (Ford)." This tells you something about him as a parent. In the end there are three things that should be considered. First, which story has more Corroborating support? Seeing as Ford's friend who was supposedly at the party where all this happened has no memory of it and Kavanaugh's childhood friend also denies the events took place and the numerous other character witnesses from all time periods of Kavanaugh's life this supports Kavanaugh's story. Second, considering Feinstien not only had the report, but was recommending lawyers for Ford very early on but didn't release any information until the 11th hour, this smells of political chicanery. Further, Feinstien admitted she didn't know if it was true. Her own confidence in this report was shaky. Third, there is not only a presumption of innocence in the constitution, there ought to be a presumption of innocence. I realize this isn't a criminal preceding, but a couple of timely accusations ought not be enough to ruin a person's life and take away their career. Make no mistake, that is what is happening. The subsequent accusations have fallen apart quickly, so far the only one that appears possible is Ford's. Kavanaugh should be moved forward as the nominee and confirmed barring any further evidence. John Byrne is a pastor who has been spouting off his opinions his entire life (just ask his mom). This little blog is his venue for continuing in this tradition.